ORCHARD PARK, N.Y. (AP) — A week before launching his first pass in a competitive NFL setting, rookie quarterback Josh Allen stood in awe amid a throng of Buffalo Bills fans who were not only chanting his name but also that of his mother. “Mrs. Allen! Mrs. Allen!” they yelled, trying to get the attention of LaVonne Allen, who was standing on New Era Field following a recent practice, watching her son signing countless autographs. “I’m just kind of speechless right now,” Josh Allen said, referring to the attention he and his mother have received since training camp opened three weeks ago. The Bills’ first-round draft pick took his first big step in that process during Buffalo’s 28-23 preseason-opening loss to Carolina on Thursday night. A loud cheer went up following the second-half kickoff, when Allen — in his No. 17 jersey — took the field for the first time. And the buzz grew on the first play, when Allen faked a handoff and effortlessly threw the ball nearly 60 yards only to have receiver Robert Foster catch it just out of bounds along the left sideline. It wasn’t, however, lost on McDermott that the pass was one of many that fell incomplete, a reflection of how much Allen still has to develop before being deemed ready to take over as the team’s starter. Allen finished 9 of 19 for 116 yards, and essentially threaded a needle between two defenders by hitting rookie Ray-Ray McCloud III for a 14-yard touchdown pass. There were some errant throws, too, such as the short swing pass to his right that sailed well wide of Foster early in the fourth quarter. McDermott continues to be ultra-cautious in not wanting to rush Allen’s development. 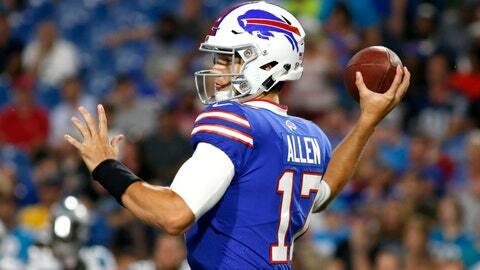 Allen works mostly with the third-string offense, while returning backup Nathan Peterman and free-agent addition A.J. McCarron are splitting time with the starters. The 22-year-old Allen represents a hopeful future for a franchise that appears to be moving on an upward trend. The Bills sneaked into the playoffs on the final day of the season to snap a 17-year playoff drought — the NFL’s longest active streak. Buffalo then traded third-year starter Tyrod Taylor to Cleveland, and moved up five spots to draft Allen seventh overall in a bid to fill a position that has remained unsettled since Hall of Famer Jim Kelly retired after the 1996 season. As for the attention Allen has attracted, McCoy isn’t surprised. Allen is taking it one step at a time, and focused on not allowing the buzz to distract him. LaVonne Allen is impressed by and grateful for the welcome she and her son have received. It’s a lot like what happened during Allen’s three-year stint at Wyoming, where two years ago he led the school to its first appearance in the Mountain West championship game.